PUBG Mobile is one of the most beloved games in the world, with over 300 million downloads worldwide. With a flourishing esports scene in North America, and with the dominance of our new squad in competitions past and present, they were an obvious choice for Nova to bring to the family. Our squad is made up of players Edwin, S4M, £pÎc, Cotto, and player/captain Beowulf. North American players may be familiar with their names already - they’ve been tearing up the NA competitive circuit and consistently rank high in the leaderboards. Follow him on Twitch, YouTube, and Twitter! Check out his Omlet stream, YouTube, and Twitter! Follow him on Twitter, and check out his YouTube channel! We’re insanely confident in our squad’s ability to obliterate the North American competition! 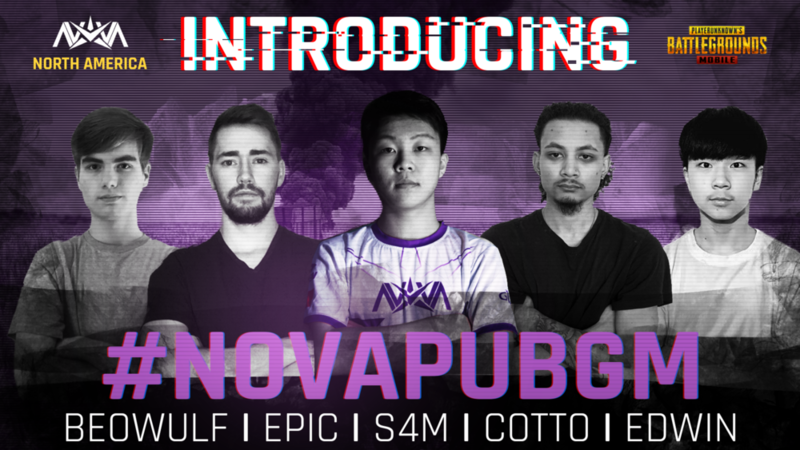 They’re currently playing for keeps in the ESL Mobile Open and PUBG Mobile Club Open - follow our social media to hear the latest news on #NovaPUBGM.